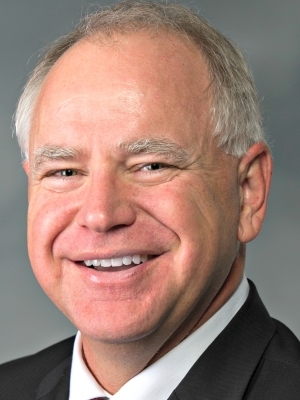 The son of a public school administrator and community activist, Tim Walz was born in West Point, Nebraska on April 6, 1964. Raised in a rural community, Walz spent his summers farming with his extended family. In 1982, Tim Walz graduated from Butte High School along side his 24 classmates. During his adolescence, Tim’s parents instilled in him the Catholic values that propelled him into a life of service. When Walz enlisted in the Army National Guard at the young age of 17, he had no way of knowing he would spend more than two decades serving America as a member of the Guard. After high school, Walz worked a number of odd jobs before accepting a temporary teaching position at the Native American Reservation in Pine Ridge, South Dakota. It was his experience at the Pine Ridge reservation that convinced Tim to follow his father’s lead and become an educator. In 1989, Walz earned a B.S. in social science education from Chadron State College in Nebraska. That year he earned the title of Nebraska Citizen-Soldier of the Year. With his teaching degree complete, Harvard University offered Walz an opportunity to gain a new perspective on global education by teaching in the People's Republic of China. Working in China during 1989-1990, Walz was a member of one of the first government sanctioned groups of American educators to teach in Chinese high schools. Following his return, Tim seized the opportunity to develop a program of cooperation between American and Chinese students that continues to this day. Walz established a small business called Educational Travel Adventures, Inc. thorough which he conducts annual educational trips to China for high school students. The business includes a scholarship program that allows students to travel and study in China regardless of their financial situation. Over the years, Walz has also served as a visiting Fellow of International Relations at the Macau Polytechnic University, a position that helped develop his knowledge of China’s unique international status. Upon his return to the U.S. in 1990, Walz served full-time in the Army National Guard. He subsequently accepted a position teaching and coaching in Nebraska where he met his wife, Gwen Whipple. In 1993, Walz was named the Outstanding Young Nebraskan by the Nebraska Chamber of Commerce for his service in the education, military, and small business communities. Married in 1994, Tim and Gwen Walz moved to Mankato, Minnesota two years later. The couple accepted positions teaching and coaching at Mankato West High School where Tim continues to teach today. Tim Walz’s inspiring approach to teaching has gained him recognition as the 2002 Minnesota Ethics in Education award winner, 2003 Mankato Teacher of the Year, and the 2003 Minnesota Teacher of Excellence. Walz completed his master's degree in educational leadership in 2001 and is currently working on his doctorate at St. Mary’s College in Winona, Minnesota. After 24 years in the Army National Guard, Command Sergeant Major Walz retired from the 1-125th Field Artillery Battalion in the spring of 2005. Prior to retiring, Walz served overseas with his battalion in support of Operation Enduring Freedom. Tim and Gwen have one daughter, Hope, who was born in 2001.